Profits from coal mining paid for Wollaton Hall and Deer Park, and the agricultural buildings which house Nottingham Industrial Museum. Mining in Nottinghamshire began in the 15th century in and around Wollaton, and later at Strelley. The Willoughby family of Wollaton developed coal mines from the 1540s. Around the same time, the Strelley family started mining on their nearby manor. However Sir Francis Willoughby (1547–1596) was soon rich enough to build Wollaton Hall. He partly financed the build by selling coal to Lincolnshire in return for Ancaster limestone and he used the limestone to build the hall. Initially, the mines were so profitable that they created disagreements between the families. However, the Strelley mines proved unsuccessful, and by 1620 they mortgaged them to London merchants. Early mines were shallow, and horse-powered Gin Wheels (also known as a ‘whim-gin’) brought the coal to the surface. Our Gin Yard is named after the Gin Wheel which was housed in the centre of the yard until 2018. 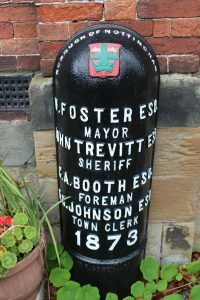 This Gin Wheel was originally erected at Langton, before being moved to Pinxton Colliery. In early 2018, after a period of bad weather, we became aware that the condition of the horse gin had deteriorated making it unsafe. After seeking specialist advice, it was clear that the safe preservation of the exhibit was not possible. This, coupled with the fact that a 2012 a peer review of our industrial collection recommended that we limit our mining collections to the Wollaton Colliery, meant the gin should be offered to another museum. We have worked with the Lancashire Mining Museum to dismantle the exhibit. Their specialists are utilising the significant reusable parts, such as the ironwork, foundation stones, brick pathway and salvageable woodwork to replicate a horse gin on their site. The Nottingham Industrial Museum are currently in the process of deciding how best to utilise and restore this space for the greatest benefit for the museum and our visitors. Before the railways and canals, horses carried coal to the River Trent for shipping. At the far side of the Gin Yard we have a coal truck in the livery of the Clifton Colliery, a mine which provided most of the coal for the Wilford Power Station which sat on land now home to the Riverside Retail Park. 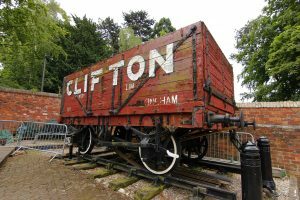 Although in the Clifton livery, we don’t know who owned the wagon before private wagon pooling in 1940 and the nationalisation of the railways and collieries in 1947/48. The owners of steam engines and steamrollers travelled the country selling their power. Unlike today’s long-term commuters, these labourers took their families on the road. 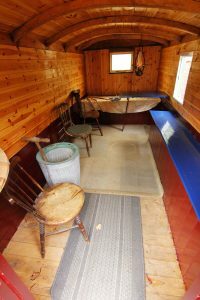 We have a recently restored a ‘Living Van’ in our yard and plan to continue its restoration to show you how these families lived on the road. Can you imagine five grown men living in this one small room? Outside the Steam Hall, the original Piggeries of Wollaton Hall look over our Demonstration Yard, and house several ‘barn’ engines which work on our Live Action Working Days. These small engines drove pumps and agricultural machinery and we have examples from a range of manufacturers. Also on display are a number of items reflecting the social history of Nottingham, such as Poor Law Boundary Markers and dyers cauldrons. There are many more exhibits, and the Gin Yard has many stories to tell. Our guides can help bring the exhibits to life. Perhaps you can help us? We are always looking for volunteers or your knowledge about our collection.